Screwdriver is too fast and too weak. I disassembled the air-powered motor I got at CF to see if the reduction unit and turbine could be separated cleanly. They do come apart, but the input to the reduction unit is the splined shaft of the turbine. 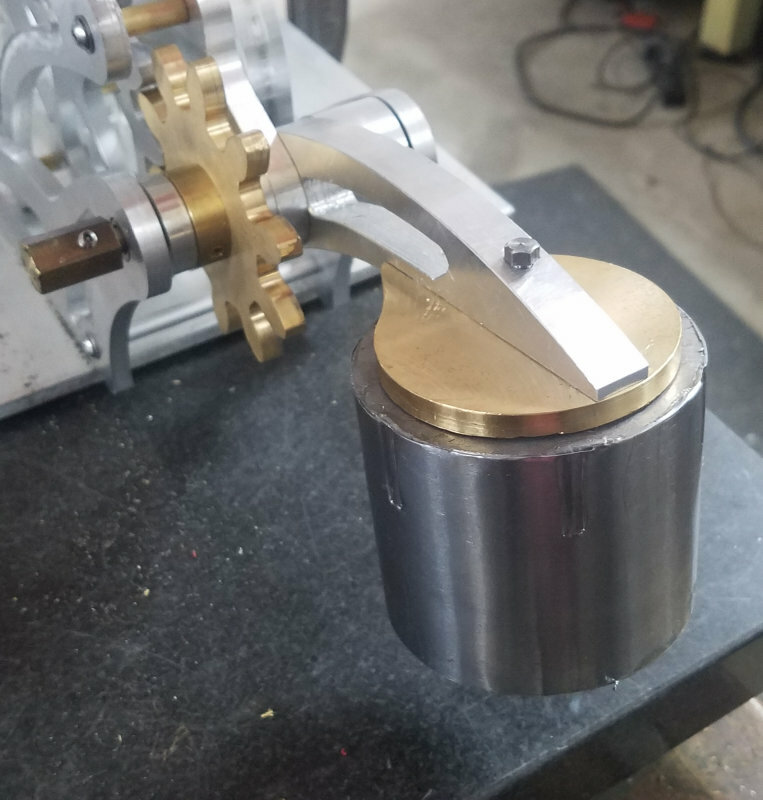 To use the gearbox I'd need to make an equivalent with 12 splines on a .300" diameter shaft. Gearbox is 15:1, so input for 7 rpm would be 105 rpm. In the interim, I decided to gamble $14 on a 7 rpm DC gearmotor via eBay. Waiting on post office for lead weights and screws to finish build and test for real. 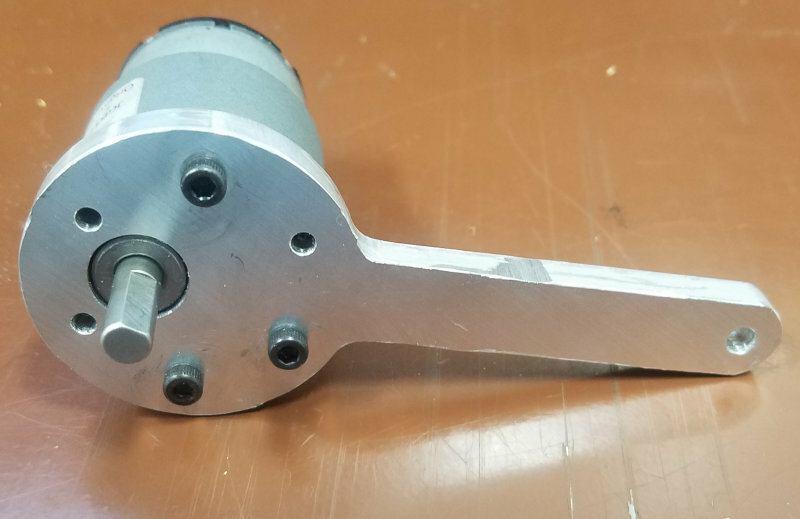 The Colibri plans call for a "crank" on the input shaft that's just a 2" diameter disk. 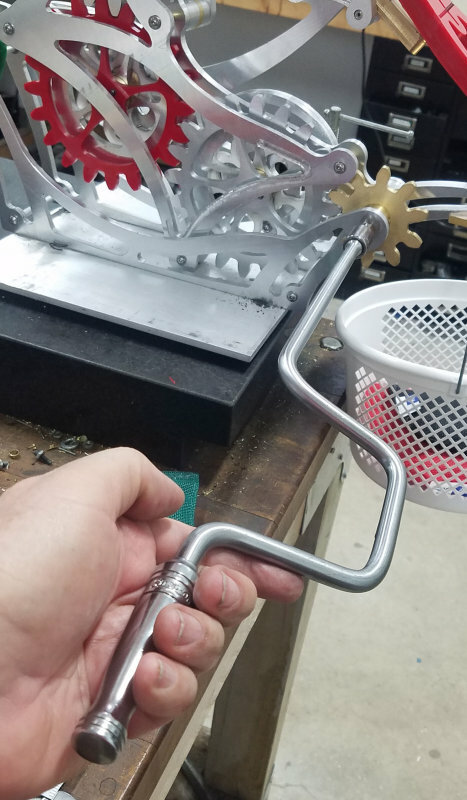 It's OK for turning the mechanism slowly, but almost impossible to do so smoothly. Why searching for a motorized solution, I came up with this temporary manual idea. 1/2" hex brass rod 1" long. Drill .251" hole 1/2" deep plus a 8-32 tapped hole for a grub screw 3/8" from the opening. This fits over the end of the input shaft replacing the disk crank. Then using a speed wrench with a 1/2" hex socket, the shaft can be turned with pretty good control of the RPMs. The lead disks I ordered came in the mail today. They have decent regularity as to diameter and flatness. I faced the mating sides and drill a 1/4" center hole through each, then assembled on a brass rod with lots of loctite 620. After a few hours of cure, I could mount on the lathe to skim turn. Finish isn't bad (didn't get a pic afterwards). Total finish weight is 7 pounds 1 oz according to my kitchen scale. The 3" length is such that the counterweight probably hits the table at Colibri's maximum angle. I'll need to measure, but the permanent base is 3/8" thick with a gap in the center, while my temporary base is 1/4" with no gap. I probably need to remake the counterweight arm 1" longer and at a higher angle than the current one. How was the lead to machine Kirk? 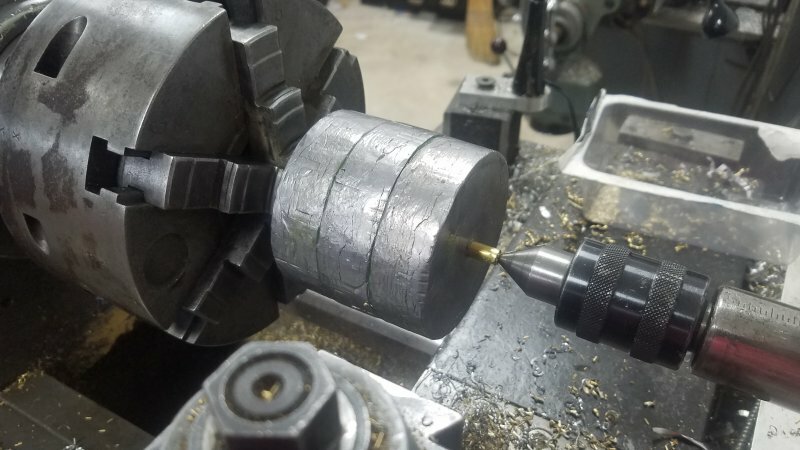 Just curious as I have never machined any? Very soft - chuck jaws left depressions in the sides. The insert I use for aluminum left a smooth finish. Drilling the holes gave continuous stringers in the drill flutes. Skim turning and facing left very fine, fluffy swarf. A lot will depend on the alloy, impurities, etc. Only 'machining' I ever did on any was drilling holes for bolts to hold some lead blocks in place in a boat. According to supplier it's 99.9% pure. Purer than Ivory soap but still doesn't float. Just flashed back to Monty Python and the Holy Grail, "what else floats?" "Very small rocks?!" 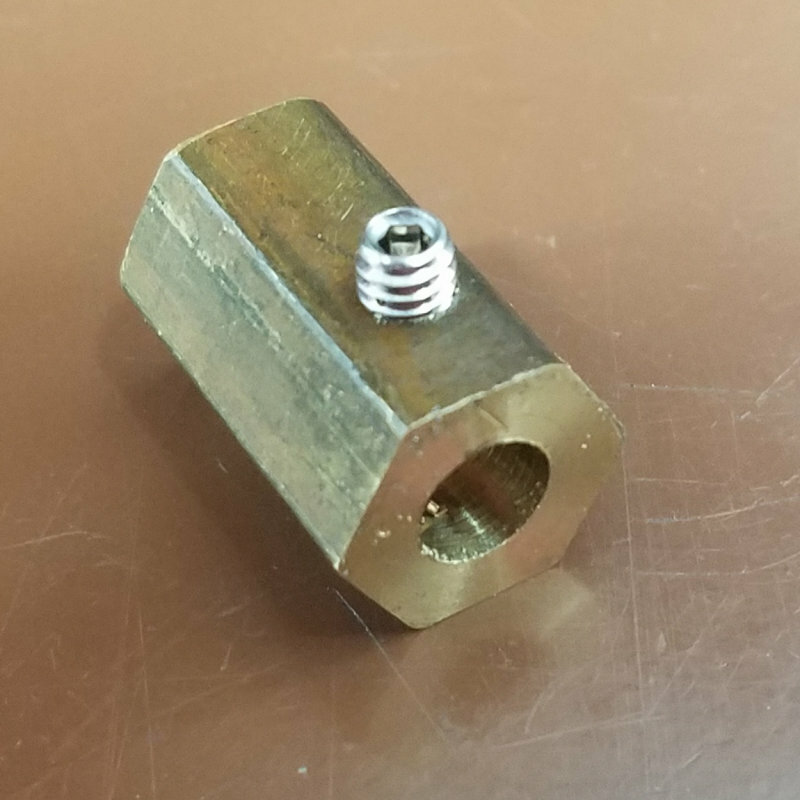 My brass 2-56 screws came in from AME go I was able to assemble the flower. I also did some measurements to determine how far above the table the counterweight would be at full Colibri height. It appears that the current weight (7 lbs) would just fit. While 8 lbs doesn't tip Colibri backwards, operating it with 7 lbs doesn't seem to require any significantly greater force. So I'm going to go with that for now. 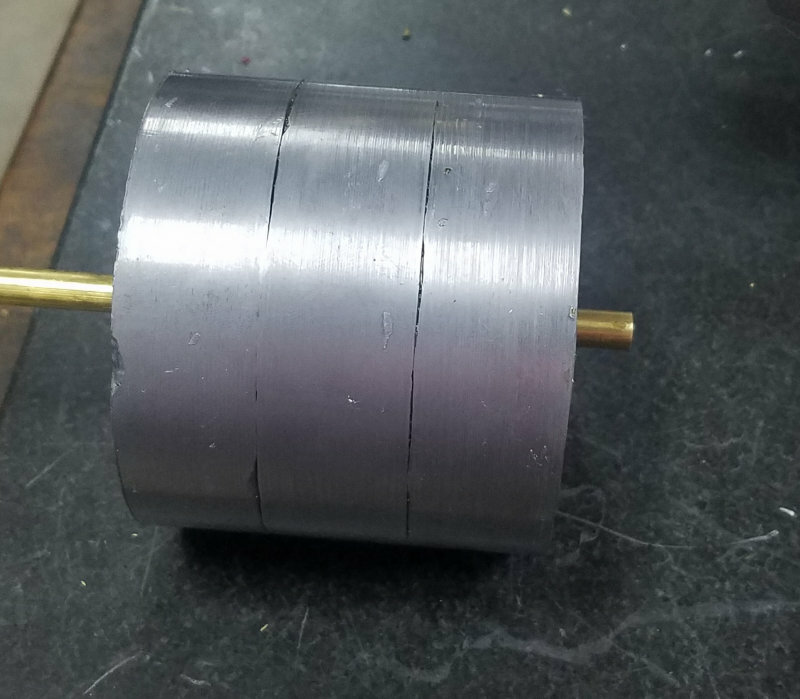 Here's the weight after turning. I suppose a coat of black paint wouldn't hurt. Looking great Kirk. Can't wait to see it in motion. I wrapped the outer circumference of the counterweight with some steel (.004") sheet, secured with epoxy. I figured the less skin contact I have with lead going forward the better. The length of the counterweight seem just short enough to clear the table at its lowest point by a whisker. My motor is at the local post office awaiting delivery tomorrow around noon. It will be interesting to see if it has sufficient torque to operate Colibri. Derek's notes recommend a synchronous AC motor. There are several of these with 6W power and 5-6 RPM on eBay, so that's another option. Of course, AC isn't often available at shows, although I did see some overhead outlets at CF. Good idea to encapsulate the lead. On my model boats I like to give the weights a coat of epoxy - ugly, but its usually inside the hull out of sight. Looking forward to seeing it all go - hope the motor works out! I received the DC motor earlier this week, cobbled up a coupling, and attached it to Colibri. Using a 12V battery charger for power and holding the motor by hand from turning, I determined that it appears to have enough torque to drive the complete cycle. 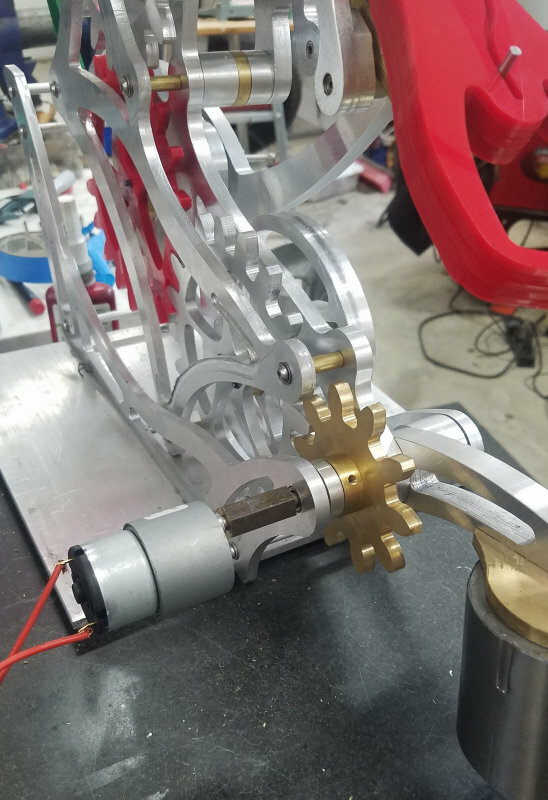 Next time in the shop I will make a motor mount I drew up in Solidworks to attach the motor to the side fame. 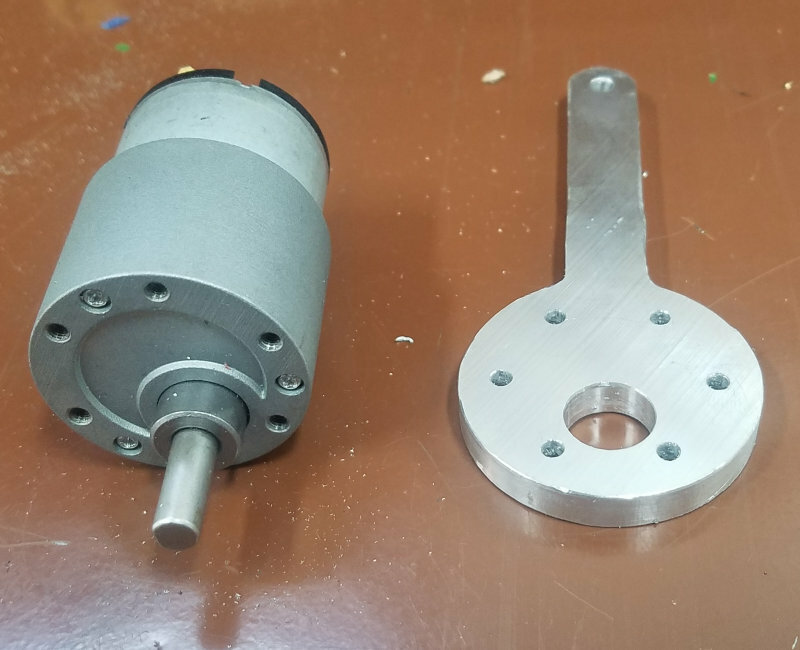 The eBay page for the motor contained a dimensioned drawing of the motor exterior, so it was simple to draw up a mount in SolidWorks and then machine it on the CNC mill. Attached to the motor with the only M3 screws I had on hand. 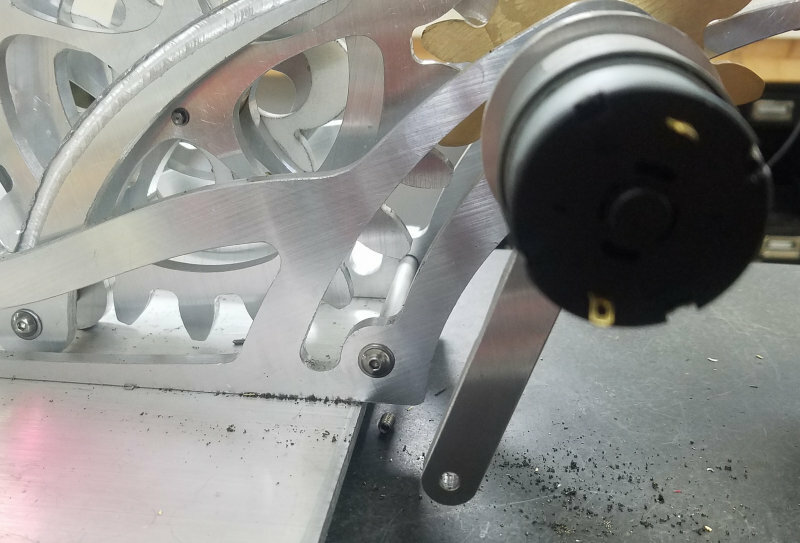 To secure it from rotating around the shaft, the hole in the tail aligns with the spreader rod holes in the support frame. Now I just need an extension to the rod to attach the motor mount. Bad Behavior has blocked 14938 access attempts in the last 7 days.